Mineral content in our food is decreasing due to a combination of soil depletion and chemicals used in conventional farming and food production. Our busy lifestyles lead us to consume convenience foods that are overly processed and low in nutrients. Foods “fortified with” are not equivalent to nutrients found in whole foods (or even in a high-quality supplement). The majority of the U.S. population has poor dietary habits. Barely 1 out of 10 people consume at least 5 servings of fruits and veggies a day. We are under more stress and often surrounded by environmental toxins, which increases the body’s need for nutrients. Antibiotics are overused, leading to dysfunction in the gut and affecting immunity. Certain medications, including birth control pills, can impact how the body assimilates nutrients. Most importantly, every biochemical process in the body relies upon vitamins and/or minerals as ‘cofactors’ to facilitate processes that help maintain physical health and achieve optimal performance. When there is even a mild deficiency, or a problem with absorption of nutrients, those processes cannot take place and can lead to chronic illnesses including Alzheimer’s Disease, diabetes, chronic fatigue, irritable bowel syndrome, depression, and PMS. Based on the above reasons, and because there is solid research on their benefits, the following nutrients are often recommended for most people. A holistic physician who interprets nutritional analysis can help you determine which nutrients are best for you: how much, for how long, and in what form (e.g., capsule, liquid). Multivitamins provide ‘dietary insurance’ for our modern lives. Since there are a wide variety of formulas, some with herbs, consult with a holistic practitioner about which is best for you. Omega Oils, known as Essential Fatty Acids (EFAs), usually come from fish but can be obtained from vegan sources (flax, chia, hemp, borage). EFAs are associated with lower risk of heart disease, depression, rheumatoid arthritis, certain cancers, and can protect against cognitive decline. Probiotics support the growth of friendly gut bacteria and help protect against diseases such as eczema, allergies, digestive conditions, and yeast infections. Trace Minerals are found in perfect balance in mineral-rich ocean waters. Just very small quantities of these elements are important to good health. Since erosion has led to nutrient-depleted soil, supplementing with liquid trace minerals is the best way to obtain these elements. Green Superfood Supplements are concentrated servings of nutrient-dense vegetables and other superfoods, such as moringa, kale, chia, chlorella, and maca; they provide important micronutrients and plant nutrients (e.g., antioxidants) that support a healthy immune system. Emerging research also supports supplementing with Vitamin D, certain B vitamins, magnesium, and selenium. These recommendations do not apply to all people nor for long term use (some supplements contain wheat and other allergens, and some may provide more nutrients than an individual needs or can tolerate). 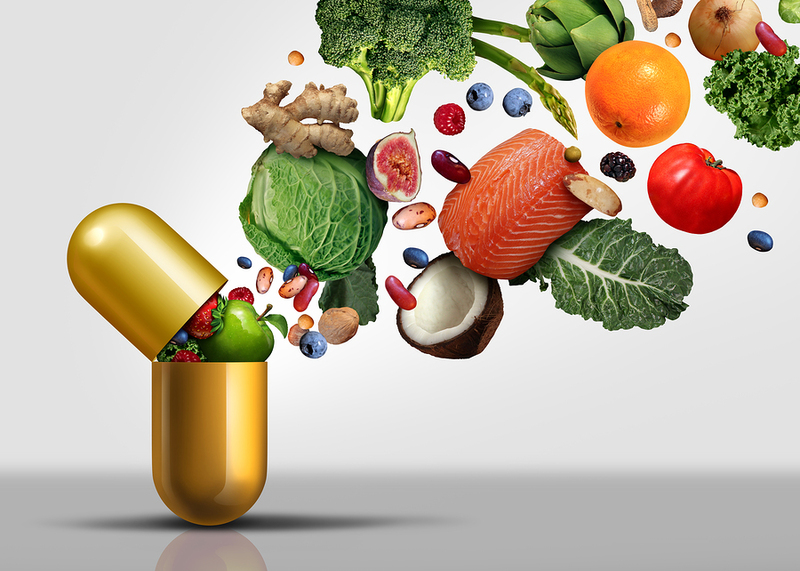 Remember, dietary supplements are intended to support and enhance your diet and lifestyle. Partner with a holistic physician to make the best choices for your health. Faloon, W. “Will Magnesium Become the Next Vitamin D?” In Life Extension(2016 Dec) pp. 7-13. Pizzorno, Joseph E. Textbook of Natural Medicine (4thEd). (2013) St. Louis, MO: Elsevier. This entry was posted in Articles and tagged antioxidant, botanical medicine, digestion, energy, gut health, healing, healthy lifestyle, healthy living, herbal medicine, herbal supplements, medicine, Natural Treatment, Naturopathic Treatment, supplements, vitamins.